Popular restaurant finding service, Urbanspoon, received a full makeover on Android this morning, along with some other goodies that are sure to impress its userbase. They are calling this major UI change a “beautiful all-native Android experience,” and we’d have to agree. While I’ll admit that I haven’t used Urbanspoon since its slot-machine-shake days, this new overhaul is quite impressive. From its hamburger slideout menu, to its tastefully done map and discover tools, I could see myself giving it another shot all these years later. 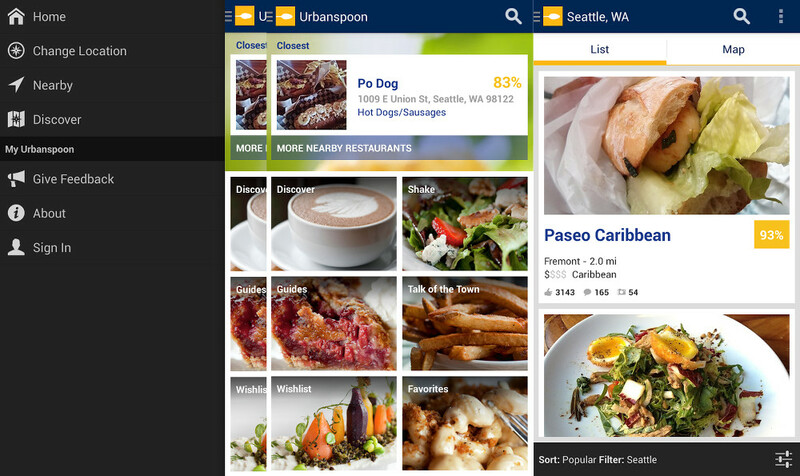 Beyond the new look, Urbanspoon now uses a more powerful search engine that can be filtered and sorted in a variety of ways. You’ll find instant info on a restaurant that is nearest you from the app’s home screen, “swipe-access” to restaurant photos and reviews, and easy browsing of guides for restaurants in your area. Again, this is quite the update. Improved “Change Location” granularity – Neighborhoods!